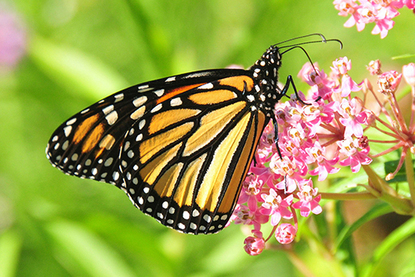 Bring color, beauty, and pollinators to your yard with native plants and flowers! The West Metro Water Alliance is urging the public to Pledge to Plant for Pollinators and Clean Water. Adding native (wildflower) plantings, raingardens, and shoreline plantings to landscapes increases pollinator corridors/habitat and protects lakes and streams by capturing and filtering runoff. The project’s goal is to persuade landowners to plant 10,000 native plantings of any size to protect pollinators and our 10,000 lakes by 2020. Stormwater runoff is the leading water quality threat to our urban lakes and streams. Turf grass, a.k.a. “green concrete,” and impervious surfaces such as streets and parking lots prevent water from infiltrating into the ground, which results in increased polluted stormwater runoff reaching lakes and streams. Native plants, or plants indigenous to the region, are well-adapted to local conditions. They also generally have longer root systems - sometimes up to 16 feet - so they absorb and filter water running off the land and mimic pre-settlement landscapes. These long-rooted plants can even break up clay soils and improve drainage. And even better, these deeply rooted plants don’t need as much water after they are established. Visit WMWA's website to make your pledge, and check out our partner Blue Thumb, whose handy website makes it easy to navigate this new way of approaching your yard. There you will find all the resources needed to plan, purchase and plant a pollinator and water-friendly garden. The plant selector allows you to search by color, sun requirements, time of bloom, height, and more. And if you are not a do-it-yourselfer, Blue Thumb has partners that are native plant nurseries, landscapers, designers, installers and hardscape producers committed to using native plants. There are also how-to videos, cost-calculators, workshops, available speakers, grants and more. Metro Blooms, a nonprofit organization that promotes gardening for environmental protection, is partnering with the Bassett Creek Watershed Management Commission, the Minneapolis Park and Recreation Board, and others to implement the “Northside Neighborhood Engagement & Opportunities in Clean Water Initiatives Project” in the Harrison Neighborhood of Near North, Minneapolis. This large project aims to engage neighborhood property owners, residents, and other stakeholders in identifying opportunities for stormwater management on private property, which may include backyards, driveways, alleyways and boulevards. The project also involves recruiting and employing neighborhood youth and young adults, providing native habitat for pollinators, improving water quality, and creating pedestrian-friendly community spaces along sidewalks. Through this program, Metro Blooms engages entire blocks of property owners, both residential and commercial, to install stormwater best management practices. The project uses the principles of sustainable development, paying close attention to the preservation of limited and costly resources, reducing waste, and preventing air, water, and soil pollution. In 2016, Phase I of the project got underway when Redeemer Lutheran Church on Glenwood Avenue served as the demonstration site for a large Blooming Boulevards project. Phase II of the project is getting underway this year and involves targeted community engagement. This is accomplished by working with current residents of the Harrison Neighborhood Association and the Glenwood Revitalization Team to ensure that their voices, community vision, and goals are met for a livable and holistic community that is resistant to displacement, environmental racism, and climate change. Block captains in the Harrison Neighborhood are being recruited to host block parties. Interested business owners and neighbors can then learn about stormwater best management practices and the impact that their participation will have on their property, on our water resources and the community’s overall health and well-being. Sustainable landscaping for these projects is intentionally designed to be both attractive and in balance with the local climate and environment. The alternative turf designs selected will create habitat, be functional, cost-efficient, visually pleasing, environmentally friendly, and mow-able. Finally, as a component of a career pathways initiative, an on-the-job Sustainable Landcare Inspections & Maintenance Field Training & Certification program is being piloted with the youth and young adults from Youth Outdoors Programs and local contractors. The Bassett Creek Watershed Management Commission recently received a $100,000 grant from the Metropolitan Council for this project and a $134,000 Clean Water Fund grant from the Minnesota Board of Water and Soil Resources. Other partners on this project include the Minnesota Pollution Control Agency, Center for Prevention Blue Cross Blue Shield, Conservation Corps MN Youth Outdoors and the Minneapolis Park and Recreation Board. Plymouth Creek streambanks will be restored to reduce erosion and improve water quality in the creek and in Medicine Lake through a project by the Bassett Creek Watershed Management Commission and the City of Plymouth. The Bassett Creek Watershed Management Commission (BCWMC), in cooperation with the City of Plymouth, are investigating ways to reduce pollutants like phosphorus and suspended solids from flowing into Medicine Lake. The lake has been on the list of impaired waters since 2014 because of too much nutrients like phosphorus, which creates nuisance levels of algae. Although several projects in the lake’s watershed have been completed by the city and the BCWMC over the last 10 years, pollutant levels in the lake are still too high. One way to reduce phosphorus and suspended solids from reaching the lake is to restore the banks of streams like Plymouth Creek that lead to Medicine Lake. A project to do just that is underway along the creek in Plymouth Creek Park and downstream of Fernbrook Road to Annapolis Lane. This 2,500-foot stretch of creek will get some much needed repair and restoration that will reduce phosphorus contributions to the creek (and hence the lake) by 50 pounds per year and will reduce suspended solids by 90,000 pounds per year. In-stream and near-stream habitat will also be improved through this project. 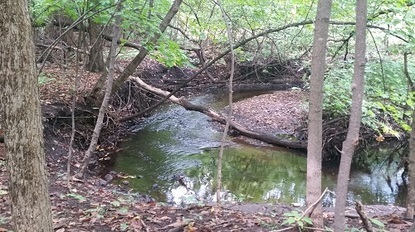 Restoration techniques will include planting vegetation like willows and grasses to stabilize streambanks, installing some rock riprap along banks, and installing rock cross vanes within the stream to channel erosive flows to the middle of the stream. Construction of the restoration project is expected this winter. The BCWMC recently received a $50,000 grant from Hennepin County and a $400,000 Clean Water Legacy grant from the Minnesota Board of Water and Soil Resources for this project. Learn more and get project updates. Tracking carp in Twin Lake by the Shingle Creek Watershed Management Commission. Managing and improving water quality in shallow lakes can be a challenge, especially if there are too many common carp and other bottom-feeding fish present. Feeding by these fish disrupts and destroys rooted aquatic plants, creates turbid water, and releases phosphorus into the water that is then used by algae to thrive. Twin Lake in Crystal, Brooklyn Center and Robbinsdale is a three-lake system with a carp problem. The Shingle Creek Watershed Management Commission is in the midst of a multi-year project to manage the carp population in the system. The first step is understanding the size of the population, where they congregate, and how and where they move around. In fall 2016, 40 carp were captured and implanted with radio transmitters. 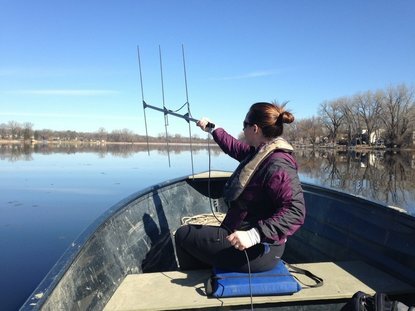 The carp are periodically tracked using a hand-held antenna, and a ground-based antenna monitors if fish are leaving the lake system through Ryan Creek. Over the winter months there were significant changes in the carps’ location within the lakes. As expected, carp were located in large dense schools in deeper water habitats in the dead of winter (January). As conditions began to warm and watershed runoff began to move water under the ice (February), the carp were located in moderate depth areas in the lake and/or areas where stormwater inputs were likely bringing in warmer, oxygenated waters. In March and April, data was gathered only one week apart and showed large changes in the locations of carp. In general, the carp appear to be schooling in shallow waters and are likely preparing for spring spawning. Successful recruitment and spawning likely occurs in shallow wetlands and/or stormwater ponds. An early ice out and limited spring flooding likely kept the carp within the chain of lakes, however, as the waters continue to warm and with the advent of spring rains, the carp appeared ready to move into their spawning habitats soon. Tracking efforts are occurring more frequently in hopes to capture the timing and location of spring spawning migrations and locations. More information about the project and maps showing the changing locations of the marked carp can be found here.